Soil pH is a useful indicator of the relative acidity or alkalinity of a soil. The pH scale ranges from 0 to 14, and the soil is assigned a value from the pH scale to describe the acidity or alkalinity. Since pH 7 falls midway along the scale, pH values that are equal to 7 are said to be neutral. However, pH values that fall below 7 are acidic, while pH values above 7 are alkaline. By definition, the pH of a soil is the measurement of the concentration of hydrogen ions in soil water. Recall that the hydrogen ion is an acid cation. The greater the concentration of hydrogen ions in the soil water solution, the lower the pH. In return, the lower the pH value, the greater the acidity of the soil will be. The concentration of hydrogen ions in the soil solution is directly proportionate to and in equilibrium with the hydrogen ions retained on the soil’s cation exchange complex. Thus, the hydrogen ions retained by clay particles replenish, or buffer, the hydrogen ions in soil water. Table 1. pH of some common items. Source: Hue, N.V. and Ikawa, I. Acid Soils in Hawaii: Problems and Management. CTAHR. Figure 3. pH values of common substances. Figure 4. The effect of soil pH on the availability of essential plant elements. Greater nutrient availability is indicated by thickened lines, whereas narrow lines indicate a decrease in availability. Indirectly, high pH can disrupt soil structure, or aggregation. There are three general pools, or sources, of acidity: active, exchangeable or residual. Active acidity is the quantity of hydrogen ions that are present in the soil water solution. The active pool of hydrogen ions is in equilibrium with the exchangeable hydrogen ions that are held on the soil’s cation exchange complex. This pool most readily affects plant growth. Active acidity may be directly determined using a pH meter, such as an electron probe. Residual acidity comprises of all bound aluminum and hydrogen in soil minerals. Out of all pools, residual acidity is least available. The quantity of aluminum and hydrogen in each of the 3 pools of acidity is not permanently fixed. Instead, the relative amounts of aluminum and hydrogen can change, as aluminum and hydrogen moves from pool to pool. Thus, the soil is said to have a buffering capacity. Buffering capacity is the ability of the soil to resist change. In the case of acidity, it is the ability of the soil to resist change in pH. Thus, aluminum and hydrogen of one pool will replenish the aluminum and hydrogen of another pool as these acid cations are removed. For example, as aluminum and hydrogen are removed from soil solution, the acid cations of the CEC replenish the soil solution. Likewise, minerals containing aluminum and hydrogen dissolve and release these cations as they are removed from the exchangeable pool. Each soil has a unique buffering capacity. As a rule of thumb, finely-textured clay soils tend to have greater buffering capacities than coarse-textured soils. Recall that 90% of Hawaii’s soils fall into this category. As a result, most Hawaii soils largely buffer soil acidity. This has great implications on nutrient management since buffering capacity determines the amount of resources, such as lime, that must be added to correct soil acidity. Soils that have high buffering capacities require larger amounts of liming resources to raise the pH to a target value than soils with low buffering capacities. The primary problems related to soil acidity in Hawaii are aluminum and manganese toxicities. Both toxicities, if not prevented, may cause severe damage to the crop and crop yield. Aluminum toxicity can occur in soils that have large amounts of aluminum containing minerals. In such soils, aluminum can dissolve into the soil solution as the soil pH drops below 5.4. In contrast, aluminum solubility decreases dramatically as the soil pH increases above 5.4. As a result, proper management of soil pH can prevent problems associated with aluminum toxicity. Excessive amounts of aluminum can inhibit root development and limit crop growth. Aluminum saturation is an expression which describes the relative abundance of aluminum in the soil. Like base saturation, aluminum saturation is the percentage of the CEC occupies by aluminum. Like all cations, aluminum held by the cation exchange complex is in equilibrium with aluminum in the soil solution. 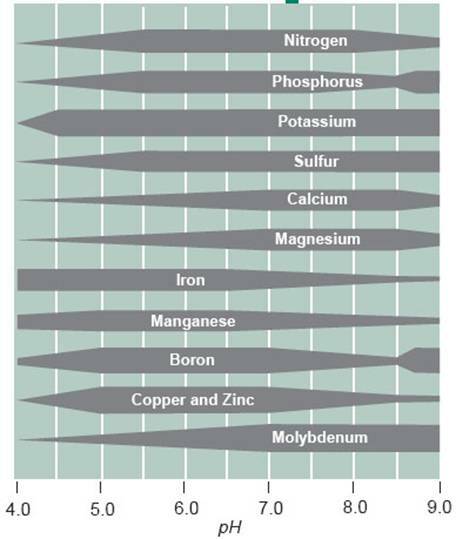 Although the tolerance to aluminum varies among plant species, most plants do not tolerate greater than 15% aluminum saturation. However, certain crops grown in Hawaii, such as sugarcane, pineapple, corn and ti, can tolerant relatively high levels of aluminum saturation. Aluminum toxicity occurs readily under acidic conditions, especially when pH values are equal to or less than 5.4. In the acidic soils of the tropics, aluminum toxicity may become a serious problem and limit crop yield. Management of soil pH is the key factor in avoiding aluminum toxicities. Aluminum toxicity may be ameliorated by liming your fields. Manganese toxicity can become a problem in soils with manganese-containing minerals. When these minerals dissolve, manganese ions are released into the soil solution. Although manganese is an essential plant nutrient, excessive quantities of manganese may be detrimental to plant growth. Manganese toxicity symptoms include yellowing of leaves (chlorosis) of older leaves, which darken into small, brown spots. Although crop tolerance of manganese toxicity varies, most crops are sensitive to high levels of manganese. For example, manganese toxicity will result in the “sudden crash” syndrome of watermelon, in which plants suddenly wilt and die. Cases of “sudden crash” have been reported on O’ahu. Manganese toxicity can develop in soils that contain manganese-minerals. Moist, organic soils under acidic conditions are especially susceptible. Like aluminum toxicity, management of pH is very important. When the soil pH drops below 5.2, manganese minerals become highly soluble and perhaps toxic. Farmers may reduce manganese toxicity by liming and aerating fields. Aeration may be accomplished by irrigating less or draining water from fields. Table 2. The effect of soil pH on aluminum and manganese in selected Oahu sugarcane fields. However, care must be taken if the soil contains manganese-oxide minerals, since flooding conditions may lead to manganese toxicity. Crop consideration is also required. Flooding conditions reduces the oxygen within the soil, which is needed for plant life. As a result, crops that do not tolerate high amounts of water and low oxygen levels are not be suited for flooded conditions. Taro and rice are examples of crops that grow well in flooded lowlands. Additions of organic matter: Additions of organic matter is a viable option to manage problems associated with soil acidity. Organic matter increases the cation exchange capacity of the soil. As the base saturation increases, the relative amount of “acid cations” decreases. In addition, organic matter forms strong bonds, known as “chelates,” with aluminum. Chelation reduces the solubility of aluminum and soil acidity. Again, if your soil is prone to manganese toxicity, it is not suggested that you add organic matter. Additions of wood ash: Like organic mater, wood ash increases base saturation and forms chelates with aluminum. Conventional Liming: Various liming materials may be added to the soil that neutralize, or counteract, soil acidity. Liming materials are bases that react with hydrogen ions in the soil solution to form water? Examples of common liming materials are limestone (calcium carbonate), dolomite (calcium/magnesium carbonate), hydrated lime (calcium hydroxide), and quicklime (calcium oxide). Calcium and magnesium silicates are also used as liming agents. If you make the decision to apply lime to your soil, how much lime should you apply? Like other soil properties, the lime requirement will various depending upon the soil. There are four guidelines that help us determined the lime requirement: the desired change in pH, buffering capacity of the specific soil, type of liming material, and the fineness or texture of the liming material. Should you lime your soil? The optimal pH range for most plant is between 6.0-6.5. To avoid aluminum and manganese toxicity problems, a soil should be limed if the pH is less than 5.4. What is you soil type? Recall the rule of thumb governing buffering capacity. Since finer textured soils have greater buffering capacity than coarser textured soils, more lime must be added to the finer textured soil to achieve the same effect and reach your target pH. What type of liming material should you use? Due to differences in chemical composition and purity, liming materials have varying neutralizing strengths. See Table 5 below. As a result, you must know the neutralizing strength of your liming material before you can determine how much to add to the soil to reach a target pH. What is the texture of your liming material? In general, the finer the liming material, the greater the neutralizing activity. However, application of extremely fine lime may be difficult, especially under windy conditions. The calcium carbonate equivalent (CCE) is an important measurement in determining how much lime should be applied to your soil. By definition, CCE is the capacity of the liming material to neutralize acidity. CCE is expressed as a percentage of calcium carbonate, which serves as the standard (100%). Source: Uchida, R.S., and N.V. Hue. Soil acidity and liming. p.101-111. In: Silva, J.A. and Uchida, R.S. (eds.) Plant Nutrient Management in Hawaii’s Soils: Approaches for Tropical and Subtropical Agriculture. College of Tropical Agriculture and Human Resources, University of Hawaii at Manoa, Honolulu. A direct benefit of liming your soil is to reduce aluminum saturation. Most plants suffer when aluminum saturation is greater than 15%. You can first determine the aluminum saturation through soil testing, and then determine how much lime is required to neutralize the exchangeable Al. This is particularly important in the tropics, where aluminum saturation can become high. Easy to read and interpret, liming curves are very useful tools in determining the calcium carbonate equivalent that should be added to a particular soil to reach a target pH. Liming curves can be experimentally determined and calibrated for specific soils. CTAHR has published liming curves for selected soils of Hawaii and are available on the web. After uniform application to the soil surface, lime should be thoroughly tilled into the soil for optimal neutralization of soil acidity. Since the liming material can only react at the depth to which it is incorporated, subsurface tillage may be necessary to ameliorate subsoil acidity. Liming soils that contain with perennial crops can also be accomplished with surface application with little or no tillage. Irrigation and rainfall slowly leaches the lime, which is relatively insoluble, from the surface into the soil profile where it can react to neutralize soil acidity. Using the proper fertilizer formulation is an important way to manage soil acidification, particularly in perennial crop systems where liming is less easily incorporated than in annual or short-term systems. Despite the many benefits of lime, over-liming your soil has an adverse effect. It is important to carefully considered how much to lime to add. If the pH of the soil is adjusted too high, it can induce nutrient deficiencies (such as phosphorus and micronutrient deficiencies), as well as permit molybdenum toxicity. Gypsum is a soil conditioner that may be used to correct aluminum problems in the subsurface soil layers. However, it is important to make the distinction between lime and gypsum. Although both are sources of calcium, lime raises the pH of the soil, while gypsum does not. To facilitate your liming and fertilization calculation, we provide easy-to-use calculators. These calculators enable immediate determination of the quantity of fertilizers or lime needed based upon your specific land dimensions and target nutrient levels. Additionally, since these calculators were created in an excel format, you can conveniently save your calculations in record archives.